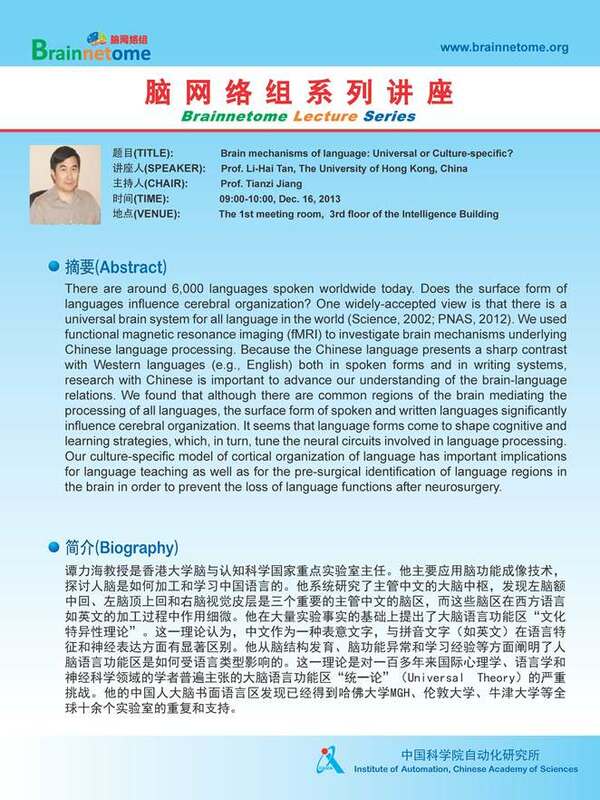 Prof. Tan's Lecture -- Brain mechanisms of language: Universal or Culture-specific? Title: Brain mechanisms of language: Universal or Culture-specific? There are around 6,000 languages spoken worldwide today. Does the surface form of languages influence cerebral organization? One widely-accepted view is that there is a universal brain system for all language in the world (Science, 2002; PNAS, 2012). We used functional magnetic resonance imaging (fMRI) to investigate brain mechanisms underlying Chinese language processing. Because the Chinese language presents a sharp contrast with Western languages (e.g., English) both in spoken forms and in writing systems, research with Chinese is important to advance our understanding of the brain-language relations. We found that although there are common regions of the brain mediating the processing of all languages, the surface form of spoken and written languages significantly influence cerebral organization. It seems that language forms come to shape cognitive and learning strategies, which, in turn, tune the neural circuits involved in language processing. Our culture-specific model of cortical organization of language has important implications for language teaching as well as for the pre-surgical identification of language regions in the brain in order to prevent the loss of language functions after neurosurgery.